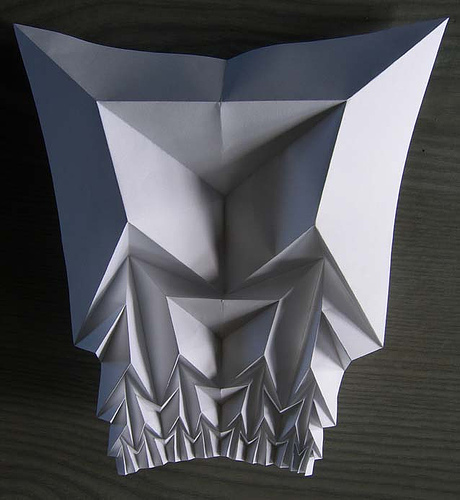 I stumbled on another interesting find over at Flickr.com: Fractal Origami. 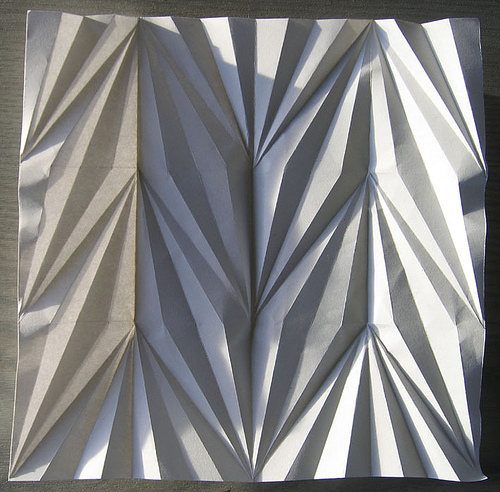 Although I’m sure work like this is painstaking and requires considerable skill in the more advanced origami techniques (there’s a special technique involved in making some of these folds), what caught my interest was its artistic appeal. In the hands of a skilled artist like polyscene (no capitals), a medium as simple as lettersize (A4) paper, along with careful lighting, can acquire the depth and subtle detail of an oil painting. Although I don’t think this second one has the fractal qualities of the first, it does have an interesting tessellated (interlocking) pattern, and that’s mathematical enough for me to toss it into the fractal category. 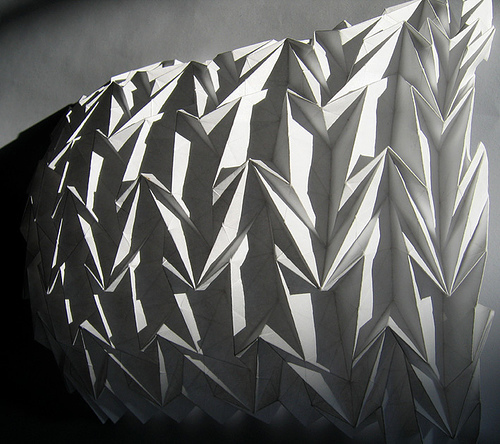 Once again, the careful lighting has a dramatic effect and in this case turns the simple origami structure into a looming cliff of folded ferocity. Ever tried making seamless tiles — by hand? Another power piece by polyscene. It’s interesting how one can instantly recognize this as a photograph of something real and not a clever digital creation. I guess even a surface as uniform as plain white paper is actually quite complex and not a simple task to imitate with algorithms. There’s a rigidity to the paper here that almost suggests it’s carved plaster. I guess that’s the effect of the special, clean folding technique that polyscene mentions elsewhere on her site that makes it look embossed or pressed, rather than bent and folded. 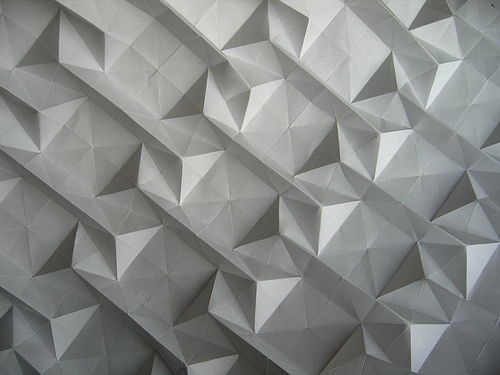 More tessellation, but the lighting produces such variations of the color gray to almost be a complete spectrum of it’s own. Perhaps it’s not so impressive knowing that it’s a photograph of an origami sculpture, but I think digital art causes one to look more closely at an image and see it as a unique and singular creation and not merely as a variation of another object under differing kinds of lighting. Well, I don’t expect polyscene will be making too many more fractals anytime soon because it’s hard work; not like the digital — click, click, presto! — kind that we make on a computer. Anyhow, I’ve found this first attempt to be very impressive and I declare polyscene to be the official discoverer of this new world of paper fractals. Let’s take this day off every year and celebrate.